It’s almost a novelty to find a self-published comic book for sale at a comic book convention these days. That market has pretty much moved either to small press conventions like SPX or online to Kickstarter and digital platforms like ComiXology. But as a frequent con-goer, I spend a lot of time in Small Press areas looking for those hidden gems in between all the pop culture mashup art prints and melty bead sculptures. It was at one of these trips in 2014 at the Baltimore Comic-Con that I discovered a precious gem of a comic called Dragis the Invincible Man. Before I get further into this review, I want to make one thing very clear. Dragis is not a “so bad it’s good” deal. It’s not a comic to be appreciated ironically. 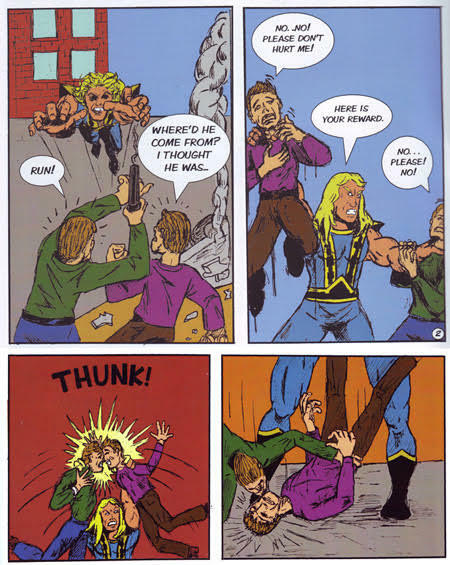 I know you’re going to scroll down and look at some of the panels and maybe think the whole point is to laugh at it. And yeah, if you read it, you’ll laugh quite a bit. But Dragis is a more effective work of art than you might think at first glance. In a world of comics-as-movie-pitches, this comic oozes sincerity. It’s anti-cynical. Jim Bell, the writer and artist behind the series, has created an entertaining mix of Silver Age superhero drama and modern serialized psychological thrillers. It’s a celebration, not only of the thrill-a-minute comics of the old days, but of the entire comic creation process. This is communicated through every single element of the book starting right at the beginning with this incredible cover. This wondrous thing practically smacked me in the face while posing some tantalizing questions. Who is this Dragis fellow? Why is he so angry? Is he really going to throw a car at those bank robbers? Or is he holding up his logo? And yeah, that logo, molded from elegant Algerian font, is not exactly a Todd Klein-level logo, but I can go buy something from the Big Two if that’s what I want! I noticed the sky behind it is blocked out strangely. Did Bell realize it would be hard to read the logo with the car parts underneath, so he just extended the sky over the car? And that © copyright symbol next to the logo -- that was meant to be a TM trademark symbol, right? The cover is awkward and a bit funny, but these aren’t mistakes. Mistakes can distract from a story or taint the intended experience of the reader. However, the choices made for this cover aren’t distractions, they’re advertisements. The cover tells you everything you need to know: (1) This is a comic book, (2) it’s about some crazy strong dude named Dragis, and (3) it was made by someone who loves making comics! And if you doubt that last one, just take a look at the adorable credits page. This is a family affair, and you can see from the dedication that this is truly a labor of love. Team Dragis highlights something that’s important about comic books and why I’m so interested in the self-published variety. I think comic creation is something that more people are able to pull off well than prose or film. For individuals like Bell that are desperate to get their stories out, great comics can be made with just a pencil and paper (and maybe a computer and some specialized software). That’s not to say that creating comics is easy, but a comic created by even the rankest of amateurs is going to be a hell of a lot more entertaining and coherent than a book of poetry or a web series on YouTube by the same creators. Bell and his team are far from amateurs, though, which is clear right from the start. The story opens with a splash page right out of 1960s Marvel with Stan Lee-style dialogue to match. Dragis defeats some would-be bank robbers when suddenly he phases out, waking up as a middle-aged, mustached man in pajamas named Stewart! This psychological twist adds depth to what could’ve been another run-of-the-mill indie superhero comic. Almost instantly you can see there’s a lot more going on here. Exposition is effortlessly woven through the dialogue, though perhaps it’s the cheesiness of that dialogue that makes it less noticeable. Laugh if you want, but it’s just fun. The worst you could say about it is that it’s inelegant or redundant (in the Stan Lee tradition of explaining through narration rather than letting the art do the work), but you won’t catch me saying it! Bell is ambitious, so there are several more twists and turns in these twenty-odd pages. Much of the fun of reading this comic comes from watching revelations stack one on top of the other until it reaches a beautiful climax. It’s worth stressing that, while you might be amused by the art, the storytelling is superb. There's no backtracking needed to understand what just happened. Whatever crazy thing you think you just read, it's real and it's spectacular, like the moment when Dragis grabs two bad guys and literally thunks their heads together. The narrative is crystal clear, and Bell’s art really shines in the fight choreography. In the major action set piece of the issue, Dragis’s epic battle with a creature named Quadroc, you could swear these characters spent months practicing. 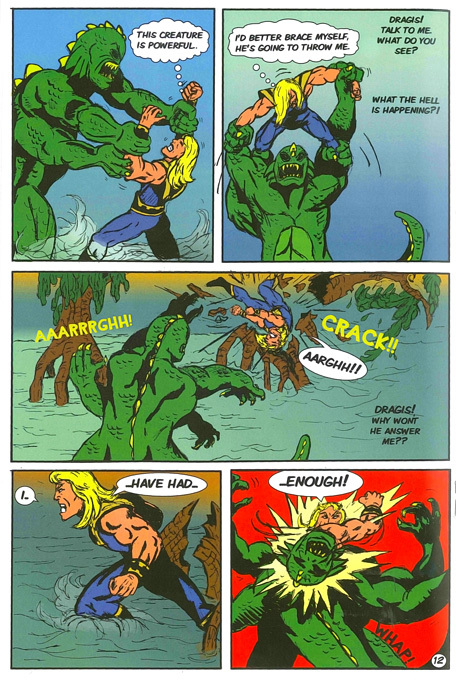 Dragis is also an incredibly re-readable comic, and I discover something new every time I revisit it. Take the panel below for example. Stewart’s doctor is trying to wake him up by snapping her fingers, and you can see the motion lines from the snap. But there’s also a snap sound effect contained within the dialogue balloon. Did her snapping fingers make a sound or, did she actually say, “Snap!” out loud? Is she some kind of weirdo that has to speak her onomatopoeias out loud? It’s not the kind of bizarre choice a Marvel or DC comic would let slip through, but this isn’t a comic produced by a huge corporation. 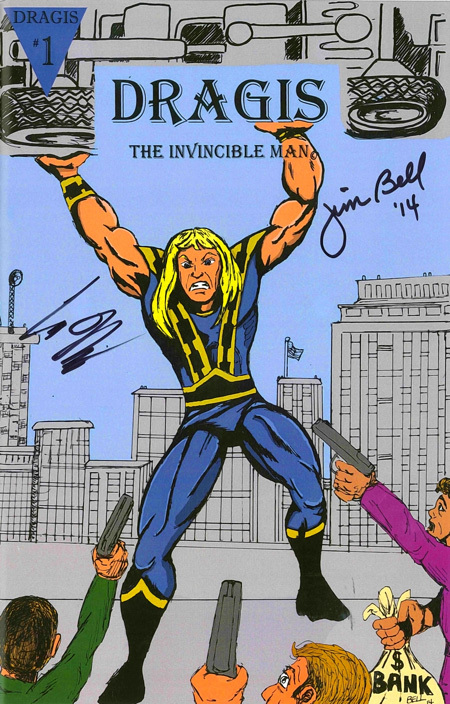 It’s Jim Bell, and he made this comic on his own time with help from family and friends. He sells it himself at conventions and cold calls comic book stores to schedule in-store signings. 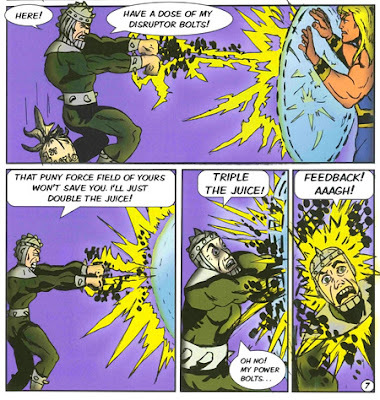 Dragis the Invincible Man is not some cynical cash grab produced as a springboard to a big publisher. Bell’s not shooting for a Dragis Netflix series (but just imagine how great that would be!). This is a sincere effort on Bell’s part to tell an exciting story in a world full of ridiculous characters. It’s the kind of exciting story he likely grew up reading, the kind of story that showed many of us just how expressive and engaging comic books could be. And you don’t have to work for a huge publisher to do it. Creating comic books is something any of us can do. We may live most of our lives as Stewarts, but if we put in the time and the work, we can tell our own stories and show the world that there’s an Invincible Man in all of us. Ben Pooped is the creator of Poop Office and a Kickstarter Superbacker. He’s drawn thousands of talking poops, so he knows all about the importance of good art. He hopes this review will inspire some Dragis cosplay, maybe even live-action role-playing of the epic Dragis-Quadroc battle. 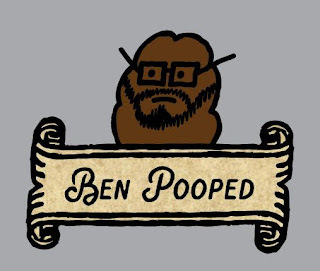 You can find him and his poops at nakedgrapecomics.com, on Twitter @BenPooped, and at the Long Beach Comic Expo February 17-18.